Anne Humphries looks at the stories behind the names on some village war memorials. On August 3 a Commemoration Service was held at St Laurence Church in Alvechurch to mark the 100th anniversary of World War I.
Rosemary sprigs bearing labels with the names of those listed on the war memorial, and others connected to the village who died, were laid at the foot of the memorial screen. The men and one woman from the village who died during, and as a result of, the war are remembered on a variety of memorials in a number of places. The memorial in the church was given by Alfred and Margaret Wiggin, of Bordesley Hall, in thanks for the safe return of their son William. Sadly his cousin George was killed and it was in George’s memory that his parents, Walter and Edith Wiggin, gave The Meadows playing fields for the children of the village. 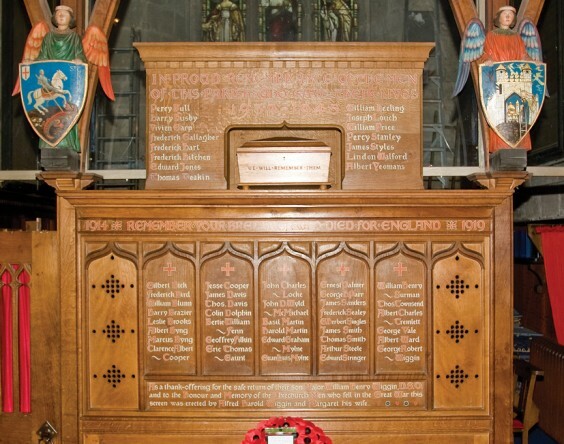 The wooden war memorial (pictured) in the church lists 36 men connected to Alvechurch who died. In some cases their link is clear – they were born here, lived here or worked here or their parents lived in the village – but there are a number whose names are not listed. Of the three men buried in World War I Commonwealth war graves in the churchyard only one, Thomas Davis, appears. Of the other two, Roland Mathews is remembered on the memorial in St Michael’s at Cofton Hackett, but it seems that Thomas Trueman is not on any Worcestershire memorial. Some Alvechurch men have their names on several memorials including local ones in Aston Fields, Bromsgrove (Independent Order of Oddfellows), Redditch and Wythall, and on those of their schools and universities. The Alvechurch school memorial, now in the Historical Society Museum, has 22 names, all but one also on the Church memorial. There is a memorial plaque on the north wall inside the church. It reads “To the Glory of God and in loving memory of Harold Stanley Underwood, died 11th March 1918 and Elsie Janet Underwood his wife, died 21st October 1918. Both gave their lives for their country”. Elsie was the daughter of Harry Boulton of The Leys, and she married Harold on December 22, 1914 at St Laurence. Harold served in the Army Service Corps but contracted TB and pneumonia and died aged 39. After his death Elsie served at the Scottish Women’s Hospital in Sallanches, France, where she died from influenza and double pneumonia. More information on this couple can be found in the November issue of The Grapevine.